As a residential roofing company in the Stroudsburg and Poconos areas, there is one question that we always seem to get asked when speaking to a homeowner about a roof replacement — “What is better, a metal roof or a shingle roof?” While it may seem like a cut and dry question with one correct answer, there are many considerations that could determine whether or not you choose to have our roofing company install a metal roof or a shingle roof. In today’s blog post, your local roofers here at Nice Shingles Roofing & Exteriors will be discussing the benefits of both styles of roofing so that you might be able to make a better, more well informed decision. Shingles are without a doubt the most common roofing material that you will see, and there are a couple of reasons behind that. Below, we have made a short list of what we believe to be the most important benefits of single roofing installations. Price – The first benefit that shingle roofing brings to the table is that they are pretty cost effective in the short term — and by “short-term” we mean 15 to 20 years. Installation – While you will not be the one installing the shingles, the ease of installation might make a difference to you. When you choose to opt for a shingle roof installation, we will be able to complete the job much faster than a metal roof installation. Repairs – The largest contributing factor to the lifetime of a roof of any kind is the cost of repairs — because, well, things happen. If a branch falls on your roof, it will be a much cheaper repair if you have a shingle roof. While shingle roofing is the most common type of roofing, there is something beautiful about a nice metal roofing installation. Below, we have made a short list of some of the benefits that might drive you to choose a metal roof when scheduling your next roofing replacement. Price – Metal roofing has a much larger initial cost than shingle roofing does, but it makes up for it with its lifetime longevity. While shingle roofing can last 15-20 years (depending on climate and conditions), some metal roofing can last up to 60 years, making its lifetime much more cost effective. 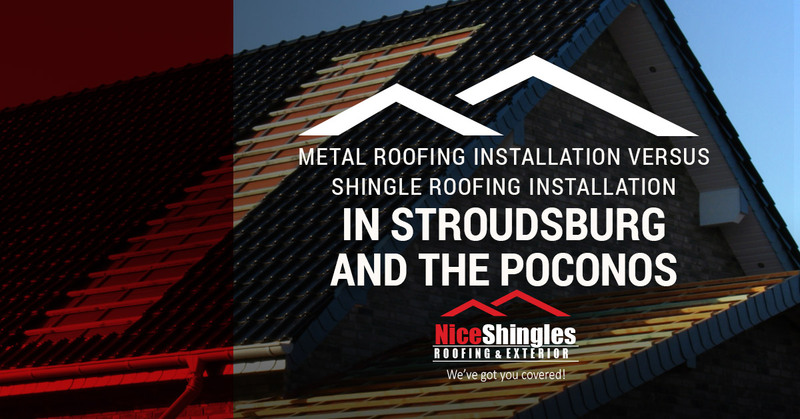 Weathering Performance – One of the largest benefits that metal roofing can provide a home in the Stroudsburg or Poconos areas is protection from the elements! Metal weathers much better than materials like plastics, asphalt, wood, and ceramics, meaning that it can take our hot summers and cool winters. Low Maintenance – One of the largest benefits that you might experience as a homeowner is how little upkeep you will have to deal with. While yes, repairs may cost more than that of a shingle roof, the damages are much less likely to occur. There are many considerations that you should make before your next roof replacement, and there are many benefits that we did not even have time to get to today. Because of this, it is imperative that you take your time to research in depth the pros and cons of each before deciding. If you are unsure of what roof is right for your home, you’re in luck — because we will. Contact us today at Nice Shingles Roofing & Exteriors today ask us any questions that you might have. If you already know the type of roof replacement you want, get in touch with us for a free quote.